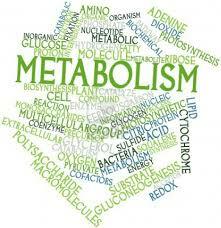 In the Metabolism Unit we will learn the importance of enzymes and how they speed up metabolic pathways. We will also look at enzyme inhibitors and how metabolic pathways can be regulated through feedback mechanisms. Metabolic reactions are regulated in response to the cell’s needs. Activation energy is the energy that must be overcome in order for a chemical reaction to occur. Activation energy more specifically can be defined as the energy needed to weaken and break the chemical bonds of the substrate. Enzymes work by lowering the activation energy needed for the reaction to occur. Outline one example of a competitive enzyme inhibitor and one example of a noncompetitive enzyme inhibitor. 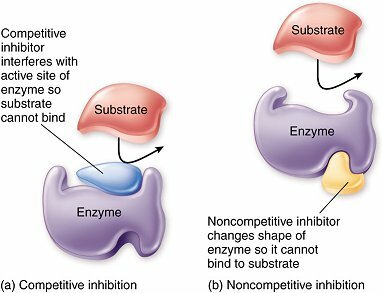 Competitive inhibition occurs when a molecule that is structurally similar to the substrate competes directly with substrate for access to the active site, thus decreasing the number of times a substrate interacts with an enzyme. 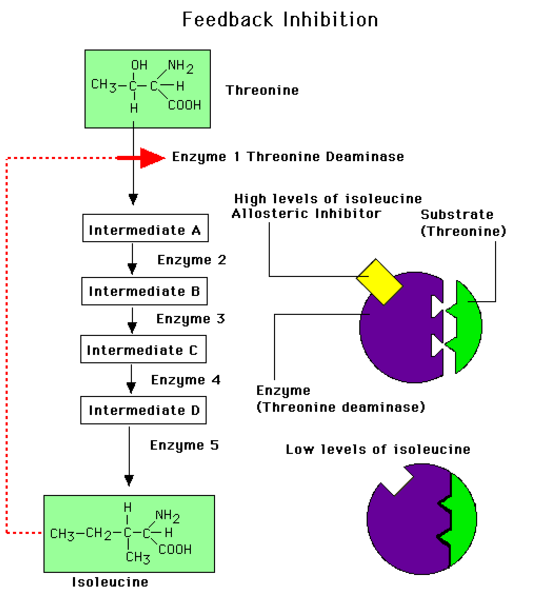 Non-competitive inhibition occurs when an inhibitor does not compete for the active site with the substrate, but instead binds to a separate site on the enzyme. While the inhibitor occupies the active site, it prevents the substrate from binding, and so the activity of the enzyme is prevented until the inhibitor dissociates. The chemical reaction rate decreases. Competitive inhibition is usually reversible but can be irreversible in some cases. Competitive inhibition can be overcome by sufficiently increasing the concentrations of substrate, thereby out-competing the inhibitor. Non-competitive inhibition is also called allosteric inhibition and the site where the inhibitor binds is called the allosteric site. 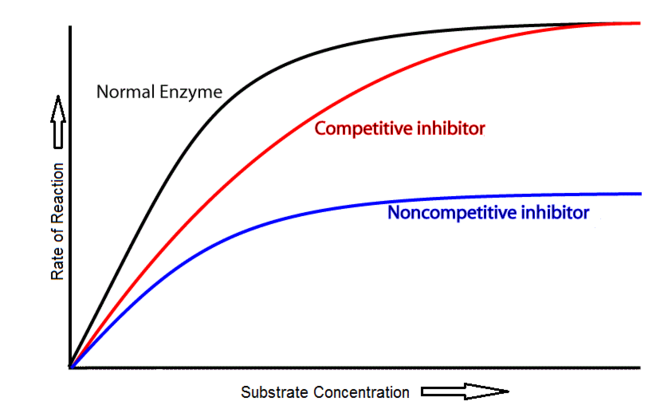 Non-competitive inhibition is usually reversible. ​Allosteric or non-competitive inhibition plays an important role in controlling metabolic pathways.. When a metabolic pathway is producing a specific product the product will also act as an inhibitor to this metabolic pathway. Important to understand mechanisms of selection, patterns of drug use in different environments and patterns of resistance. P. falciparum strain 3D7 has been sequenced by scientists and is used to test chemicals for new possible medication. One specific study tested over 300,000 chemicals against a chloroquine-sensitive 3D7 strain and a chloroquine-resistant K1 strain to determine if any of these chemicals inhibited metabolism. 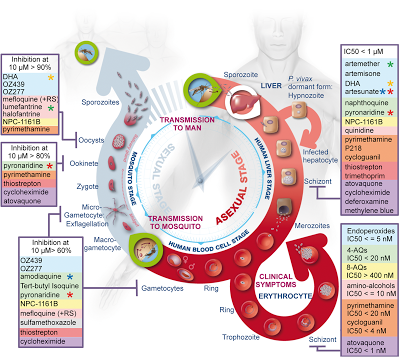 The results showed that 19 new chemicals inhibited the enzymes normally targeted by anti-malarial drugs and 15 chemicals that bound to a total of 61 different malarial proteins. This research provides starting points to produce possible new anti-malarial drugs. Catalase is an enzyme found in the cells of many tissues of living organisms. It speeds up a reaction which breaks down hydrogen peroxide, a toxic chemical, into 2 harmless substances--water and oxygen. This reaction is important to cells because hydrogen peroxide (H2O2) is produced as a byproduct of many normal cellular reactions. If the cells did not break down the hydrogen peroxide, they would be poisoned and die. In this lab, you will study the catalase found in liver cells. The following data has been recorded from the breakdown of hydrogen peroxide by beef liver over a 10 minute time period. ​Please fill in the following table and calculate the rate of reaction at each time interval. Please show one sample calculation for the rate of mass decrease over time. Please graph your change in mass over your change in time to show the rate (write in the proper labels on the axis, including units. Calculate the overall rate of reaction for the 600 second time period. What do you notice as the time increases? 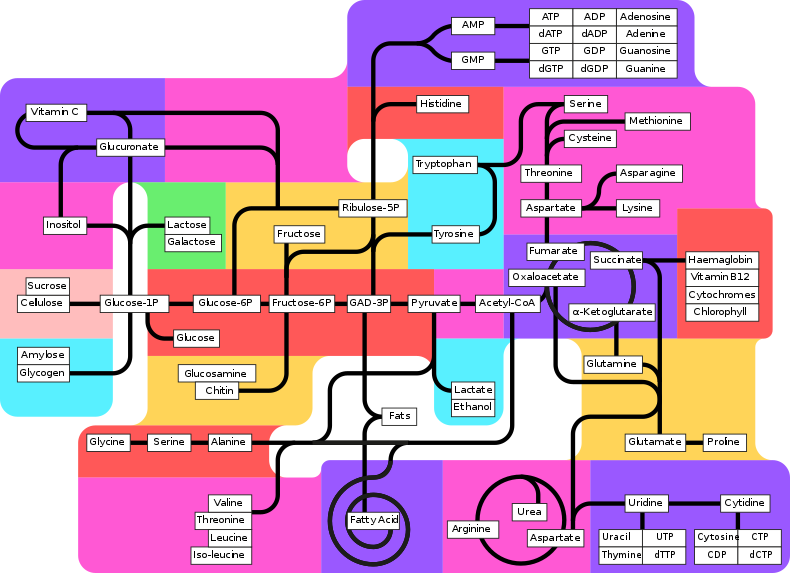 Many enzyme inhibitors have been used in medicine. For example ethanol has been used to act as a competitive inhibitor for antifreeze poisoning. Symptoms include feelings of intoxication and nausea, followed by vomiting, hyperventilation, acidosis and acute kidney failure. Ethanol acts by competing with ethylene glycol for the active site of alcohol dehydrogenase, the first enzyme in the degradation pathway. Because ethanol has a much higher affinity for the alcohol dehydrogenase, about a 100-times greater affinity, it successfully blocks the breakdown of ethylene glycol into glycoaldehyde, which prevents the further degradation into its dangerous metabolites such as oxalic acid. The Amoeba Sisters explain enzymes and how they interact with their substrates. Vocabulary covered includes active site, induced fit, coenzyme, and cofactor. Also the importance of ideal pH and temperatures for enzymes are discussed. he normal enzyme catalytic cycle is shown and is followed by two types of inhibition by competitive and non-competitive blockers.